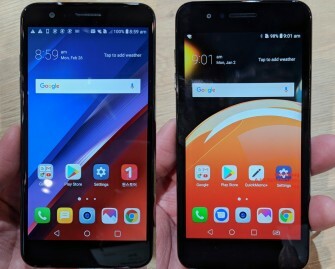 LG today revealed two new handsets, 2018 updates to its K8 and K10 mid-range series. Both phones carry over the previous generations' pebble-shaped contours and 2.5D arc glass, but make advancements in the materials. The K10, for example, has a U-shaped metal frame while the K8 relies on polycarbonate. Shared features between the new K8 and K10 include improved low-light photography thanks to Low Light Noise reduction that's combined with HDR to eliminate grain and provide more luminosity and contrast. The cameras also gain a new Timer Helper feature that uses the flash as a visual guide during timer countdowns. The Flash Jump Shot feature takes one photo every three seconds and pastes them together into a shareable GIF. Shared specs include LTE, GPS, Bluetooth 4.2, WiFi, FM radio, microUSB, and Android 7 Nougat. K10: The larger of the two phones includes a 5.3-inch 720p display and a 1.5 GHz octa-core processor. It will ship with 2 or 3 GB of RAM and 16 or 32 GB of storage, depending on the variant. The phone features a 13-megapixel main camera and either a 5- or 8-megapixel wide-angle front camera. The selfie camera can capture bokeh-style shots. Other features include a 3,000mAh battery and fingerprint reader. K8: The K8 steps down to a 5-inch 720p display and a 1.3 GHz quad-core processor with 2 GB of RAM and 16 GB of storage. The rear camera has an 8-megapixel sensor while the front camera has a 5-megapixel sensor. It has a 2,500mAh battery. 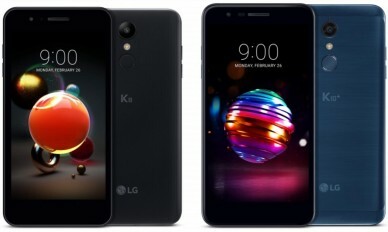 LG says both phones will be sold globally, though it didn't specify if the K8 or K10 will reach North America. The phones come in blue, black, or gold. LG didn't say when the phones will go on sale.